After lunch on Sunday I dived into the mammoth job of clearing out, cleaning and re-ordering my studio! It was never built as a painting studio, but as a wood-carving workshop, as in the 1990s I was learning to do letter carving in wood. For all sorts of reasons I didn’t continue with this, but when I started painting seriously in 2005 I was so lucky to have a ready made studio. 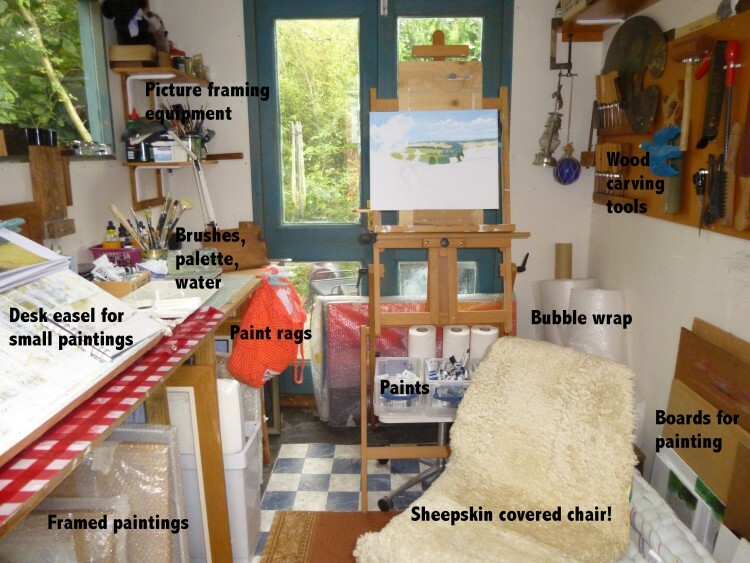 I had never really ‘sorted’ it as a painting studio, though, and all sorts of strange arrangements had crept in. The power socket for the heater, which I use all the time in the winter, was only accessible by a huge stretch across the bench. All the stuff for picture framing was on a shelf I could hardly reach because there was so much other stuff in front of it. Rolls of bubble wrap, for packaging paintings going off to exhibitions, were stuffed in wherever they would fit. There were loads of old picture frames that I would never use, and bits of all sorts that I had kept because they ‘might be useful’!Everywhere was muddled and cobwebs had reached epic proportions. Time for some action! Two and a half days hard work later, and I have a clean, tidy studio, with everything that I use regularly in a place easily to hand. The heater is just inside the door, instead of in the far corner. EVERYTHING has been taken out, ALL the rubbish sorted, and IT IS ALL NOW CLEAN!!! 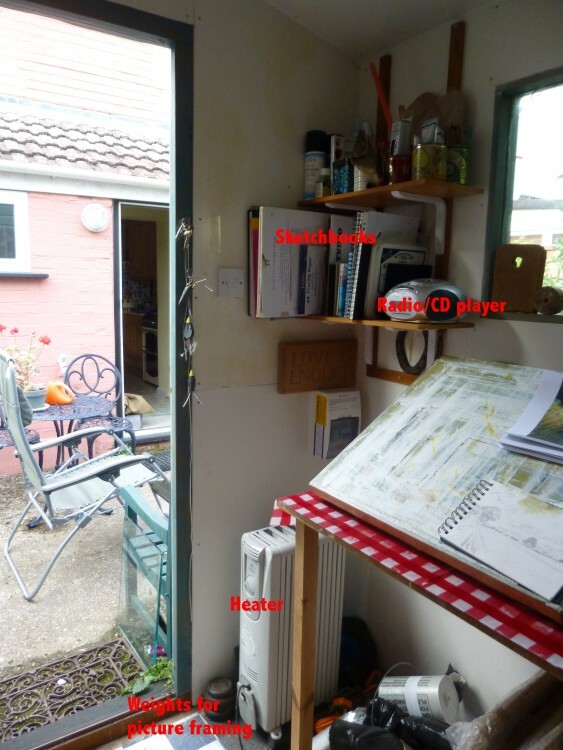 So here is a little guided tour . . . .
All I’ve got to do now is go to the tip with all the rubbish! 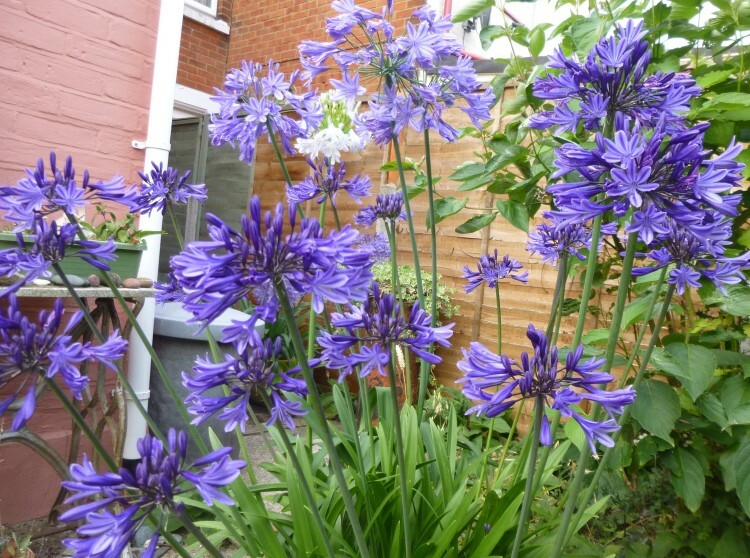 I will leave you today with a shot of colour to brighten your Wednesday – the agapanthus are now fully out, and here are the two biggest pots of them.